Still one of the best places for Disney pins is on a Disney Cruise! The fun part of pin collecting for me is finding those rare or different pins that are distinctly Disney and yet specific to their location. The Disney Cruise has plenty of those. Not only do the cruise ships have unique pins specific to their ship, but they also have pins specific to the Disney Cruise Line. They even have special lanyards for the Disney Cruise which I love and different opportunities to pin trade, even aboard a moving ship. I love the PWP (pin with purchase) program on board the cruise. For each $30 you spend you can add an additional $5.95 to purchase a mystery pin. It’s great to find inexpensive, fun Disney pins and let’s face it – if you’re on a cruise odds are you are spending more than the $30 necessary to buy these beauties. We didn’t see the sign until in Mickey’s Mainsail until we had already bought a bunch of stuff in Sea Treasures (two of the different stores on board the ship), but the cast member near the register told us it was no problem and offered to let us purchase as many as we wanted. We ended up getting exactly the ones we were hoping for – Mickey for me and Pluto and Stitch for Emma. Dressed in sailing regalia and with the DCL logo, these make for great souvenirs for the pin collector. My favorite officer! Sara traded some great pins with me. 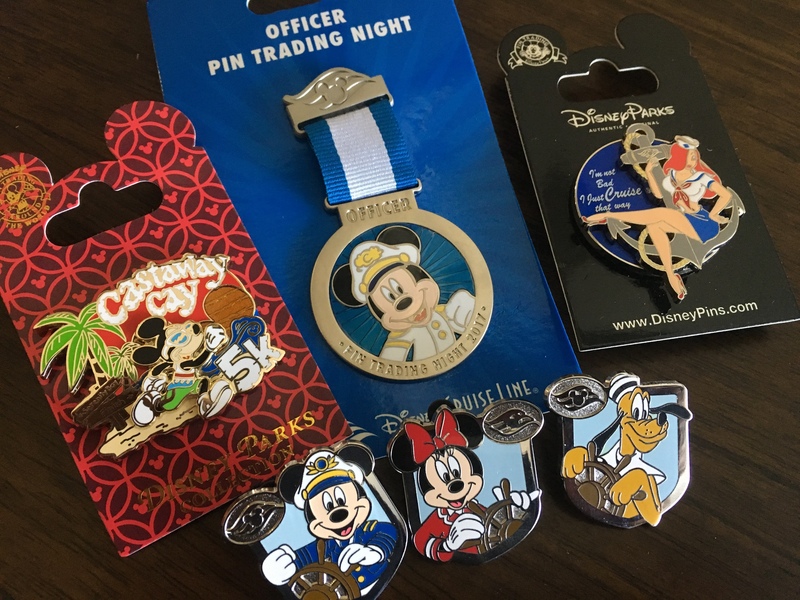 One of the beloved traditions of sailing the seven seas with Disney is the Officer Pin Trading Night. This is the best opportunity for trading on the ship! Every officer comes out to the main lobby in uniform and with a full lanyard of fresh, authentic pins. I have often found some really beautiful pins by trading with them. Often you can trade for rare, limited edition pins and it’s nice to get to meet the officers who are all very friendly. This time around (2017) I was fortunate to find two DCL pins – one a limited release Rogue One pin and one a limited edition Dark Side of the Force hinged pin. I also found an extremely rare Main Street USA pin from Disneyland’s 30th anniversary Gift Giver Extraordinaire. How this pin made its way to an officer’s lanyard is still beyond me, but it was authentic. And to top it off, only on Officer Pin Trading Night do they sell the special commemorative pin. Tip: Get there early and find an officer quick! Obviously, the best pick of pins is right when the officers first arrive. If you wait too long, you’ll end up getting other people’s giveaway pins. There are pin books on board in the stores you can look through, but so many of them have mostly scrappers and fakes. They don’t replenish the pin books during the cruise either (at least that’s been my experience) so all those people who are trading just keep recycling the same stuff. Every once in a while you’ll find a gem someone either left or got refreshed, but it’s rare. Still, I appreciate they offer the opportunity, but wish Disney would either dump the scrappers and reload with good pins, or find a way to crack down on the fakes. They used to carry more of the limited edition port pins for sale. They still have Castaway Cay (including the cool 5K pin), but these are unlimited and they don’t seem to have pins for ports like they used to. They do have limited release pins and in some ways that’s better. The later in the season, the fewer limited edition pins they would have so if you sailed late in the summer, you were unlikely to get one of those anyway. 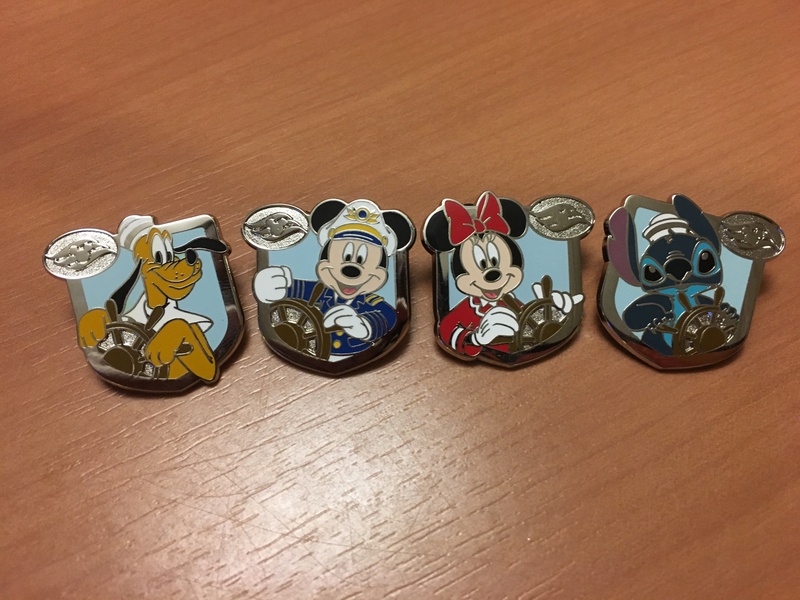 All in all, the Disney Cruise Line experience is great for those who love pin collecting, and pin trading with the officers is something I look forward to each and every time! Pingback: Pin Trading Events – What are they like? What can I expect? (Part 1 of 2) | Disney Nerd!